The Scholars’ Programme has been designed to provide exceptional opportunities and guidance for our brightest Sixth Form students. At Weatherhead we are committed to supporting our students in successfully applying to the very best universities, including Oxford, Cambridge and the Russell Group. 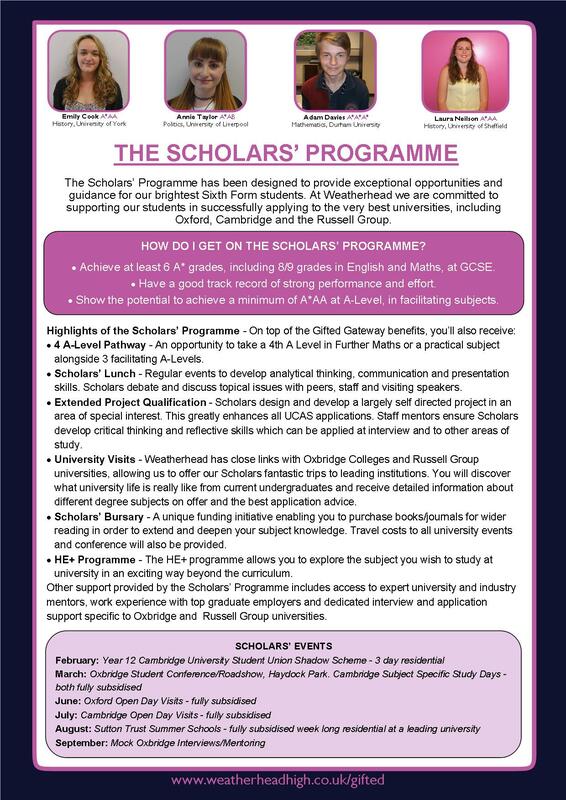 The Scholars’ Programme aims to inspire our students to achieve their potential and can provide Oxbridge mentoring and application support, as well as a full range of activities to broaden the horizons, aspirations and education of our most able students. The Scholars’ Programme at Weatherhead is led by Mr Hawkins, himself a former Cambridge graduate. How do I get on the Scholars' Programme? Students must achieve at least 6 A* grades, including 8/9 grades in English and Maths, at GCSE; have a good track record of strong performance and effort; show the potential to achieve a minimum of A*AA at A-Level, in facilitating subjects. 4 A-Level Pathway – An opportunity to take a 4th A Level in Further Maths or a practical subject alongside 3 facilitating A-Levels. Scholars’ Lunch – Regular events to develop analytical thinking, communication and presentation skills. Scholars debate and discuss topical issues with peers, staff and visiting speakers. Extended Project Qualification – Scholars design and develop a largely self directed project in an area of special interest. This greatly enhances all UCAS applications. Staff mentors ensure Scholars develop critical thinking and reflective skills which can be applied at interview and to other areas of study. University Visits – Weatherhead has close links with Oxbridge Colleges and Russell Group universities, allowing us to offer our Scholars fantastic trips to leading institutions. You will discover what university life is really like from current undergraduates and receive detailed information about different degree subjects on offer and the best application advice. Scholars’ Bursary – A unique funding initiative enabling you to purchase books/journals for wider reading in order to extend and deepen your subject knowledge. Travel costs to all university events and conference will also be provided. HE+ Programme – The HE+ programme allows you to explore the subject you wish to study at university in an exciting way beyond the curriculum. Other support provided by the Scholars’ Programme includes access to expert university and industry mentors, work experience with top graduate employers and dedicated interview and application support specific to Oxbridge and Russell Group universities. 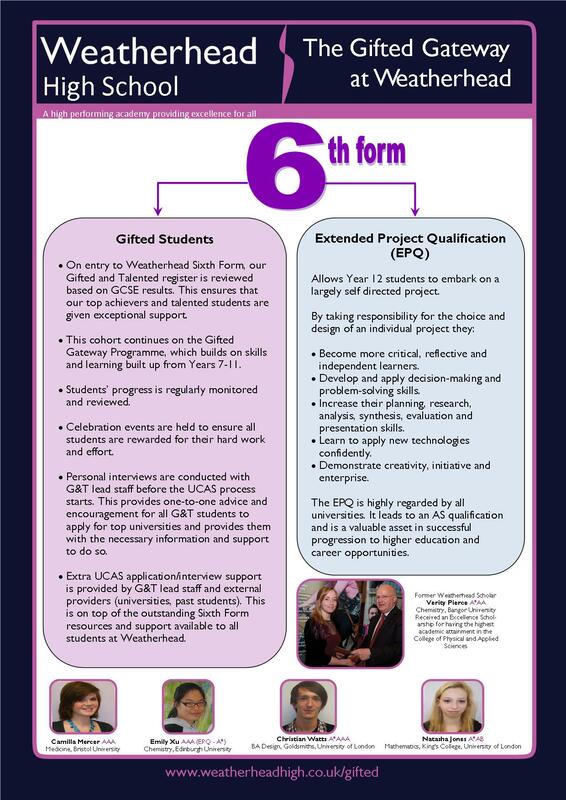 On entry to Weatherhead Sixth Form, our Gifted and Talented register is reviewed based on GCSE results. This ensures that our top achievers and talented students are given exceptional support. This cohort continues on the Gifted Gateway Programme, which builds on skills and learning built up from Years 7-11. Students’ progress is regularly monitored and reviewed. Celebration events are held to ensure all students are rewarded for their hard work and effort. Personal interviews are conducted with G&T lead staff before the UCAS process starts. This provides one-to-one advice and encouragement for all G&T students to apply for top universities and provides them with the necessary information and support to do so. Extra UCAS application/interview support is provided by G&T lead staff and external providers (universities, past students). This is on top of the outstanding Sixth Form resources and support available to all students at Weatherhead. Allows Year 12 students to embark on a largely self directed project. Become more critical, reflective and independent learners. Develop and apply decision-making and problem-solving skills. Increase their planning, research, analysis, synthesis, evaluation and presentation skills. Learn to apply new technologies confidently. The EPQ is highly regarded by all universities. It leads to an AS qualification and is a valuable asset in successful progression to higher education and career opportunities.